Bulgogi is a very popular Korean dish, usually consisting of grilled and thinly sliced marinated beef. Victoria Glass' easy beef bulgogi recipe uses a ready-made marinade infused with Korean gochujang chilli paste. Garnished with spring onion (another essential Korean store cupboard ingredient) and served with noodles and quick pickled carrots, it makes an easy meal for two. Life’s too short to eat dull food. It can be all too easy to fall back on the same rotation of recipes, week in and week out. When you’re hungry after a long day, but tired from a long week, dinner can sometimes feel like a chore. Eating something special needn’t be tricky or time consuming. When it comes to making an impact with flavour, a punchy BBQ marinade will cling to your beef and create a delicious sticky, spicy sauce. The marinade contains a blend of gochujang spices for an authentic Korean flavour. Bulgogi is a traditional Korean dish, originating from the Goguryeo era. Different regions have their own way of cooking bulgogi, but I like to add grated pear – a common ingredient in Korean marinades, as pears contain calpain, an enzyme which helps tenderise meat. Pineapple and kiwi contain the same enzyme, so you can substitute either if you wish, but I like the subtle flavour that pear brings. Bulgogi loosely translates as 'fire meat'. If the weather’s nice, you can take it literally and fire up the barbie for these marinated steaks, otherwise a hot frying pan will make this dish the work of moments. 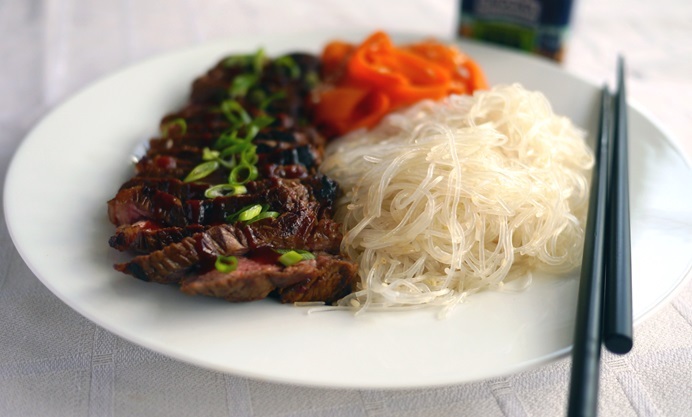 Quick, pickled carrot strips are the perfect foil for the sweet, piquant bulgogi and glass noodles are naturally gluten-free (they are made from mung beans or sweet potato) and low-carb and make for a speedy and light summer supper that practically everyone can enjoy.